A small group of Iranian farmers drove their tractors to the entrance to the town of Varzaneh. The vehicles stopped next to a canal that once provided their crops, but has been dry for years. The farmers appealed to government officials for help. The demonstrators held signs with the names of officials they blame for their dried-up fields. “How long will you eat your bread made with our blood?” one sign read. Every day, farmers hold a small protest outside the Iranian town of Varzaneh. The demonstration is a sign of the anger that has been growing over water shortages caused by years of little rainfall. But experts say the drought conditions have worsened because of mistakes by the government. Protests have grown larger, with incidents of violence, at a time when economic problems have fueled unrest repeatedly over the past year. In March, police clashed with farmers, who held a sit-in strike in Varzaneh. Mostafa Benvidi was wounded and lost sight in his left eye during the clashes. Today, he has more than 100 pellet shots in his body. Earlier this month, in another part of southern Iran, 11 people were wounded when police broke up a protest in Khorramshahr. Those protesters said their drinking water is dirty. “Officials just come and promise to deal with the crisis and then just leave,” said the 30-year-old Benvidi. He and his family used to grow corn, cotton and other crops on their 3-hectare farm. But they have not been able to farm for years because of lack of water. Now Benvidi is unemployed. His family earns money from the seasonal building work his brothers get in nearby towns. His sister makes carpets to sell. In this Tuesday, July 10, 2018 photo, where the Zayandeh Roud river once watered the region, desicated salt-laced fields surround the Gavkhouni wetlands, outside town of Varzaneh, Iran. Over the past 10 years, Iran has experienced its worst drought in more than 30 years, according to the United Nations Food and Agriculture Organization. Iran’s Meteorological Organization estimates that 97 percent of the country is affected. 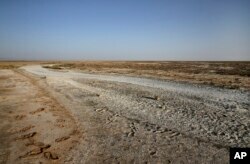 The dry conditions have affected Isfahan province, where Varzaneh is located, and other parts of central Iran. The Zayandeh Roud River once provided water to the area. The water came down from the Zagros Mountains, through the city of Isfahan and through farming towns, including Varzaneh. But the river dried up years ago. The fields around Varzaneh are now dry dirt. Around 90 percent of the farming activities have ended, said Reza Khalili, an environmental activist. Government policies have worsened the effects of the drought and growing population, Khalili and other observers say. The government is building more factories, taking large amounts of water. In July, officials opened a steel factory in Isfahan. Water has also been sent to other areas. The normal water system has been destroyed and all the water has been set aside for businesses, explained Khalili. Outside of Varzaneh, migrating birds once stopped at a wetlands. Now the area is an empty field of salt that causes sandstorms. The people of Varzaneh are proud of the town’s history. It sent of hundreds of its young men to fight in the Iran-Iraq war in the 1980s. More than 100 were killed in the fighting, and their memory is still important. Now young men leave the area in search of a better life. “Many of my friends moved to near and far towns to find jobs,” said Ruhollah Sohrabi, a farmer who now works as builder in other cities. In 2012, farmers in Varzaneh fought with police and broke a pipe that transports water from Isfahan to the neighboring province of Yazd. Similar protests continued from 2016 to now. At one time, the government paid around $250 to each family affected by the crisis. But people want a real solution. “More social conflict may be on the way. Officials do not have the necessary expertise to manage water resources,” said Hamid Safavi, a professor at Isfahan University of Technology. Safavi said each province decides on its own how to use its water, without looking at the effect it has on the larger area. Unless policies change, “we are heading from a water crisis to a disaster,” he added. The Associated Press reported this story. Susan Shand adapted it for VOA Learning English. The editor was George Grow.